Pomona students are given a great deal of autonomy to decide the scope and purpose of their education. What’s possible here is bounded only by your academic imagination and drive. In addition to the 600 courses offered each year by Pomona, our student may take courses at the neighboring Claremont Colleges. Pomona College offers 48 fields of study/majors in the arts, humanities, natural sciences, social sciences and interdisciplinary fields. With an average size of 15, most classes here are taught as seminars, in which the professor serves not as the source of all knowledge, but as a participant in a common search for understanding. The Los Angeles area offers rich and diverse opportunities. Geology students study deposits of volcanic rock in the local mountains. Art history students go to L.A. to examine the work of Chicano muralists first hand. Photography students learn about satellite imaging at the Jet Propulsion Laboratory near Pasadena. Few undergraduate institutions can match the range of special resources you’ll find at Pomona. An artificial intelligence lab, an award-winning theatre, a new studio arts hall, an 85-acre biological field station, a digital planetarium and a scanning electron microscope are examples. You won’t have to wait long to delve into research at Pomona. A number of our students are already immersed in projects in their first year, tackling sophisticated research in nanotechnology, DNA and aging, and dwarf planetary rotation, to name a few topics. Pomona offers 59 programs in 34 countries for our students. Would you like to study tropical biology near the Great Barrier Reef in Australia? Take an intensive language program in China? Conduct independent research in Nepal? Or take one-on-one tutorials with professors at Cambridge? At Pomona, we have long known that involvement in the arts can play a key role in shaping these creative and intellectually daring habits of thought. From choral groups to sculpture, from theatre productions to ballroom dance, Pomona is alive with opportunities to engage in the arts. 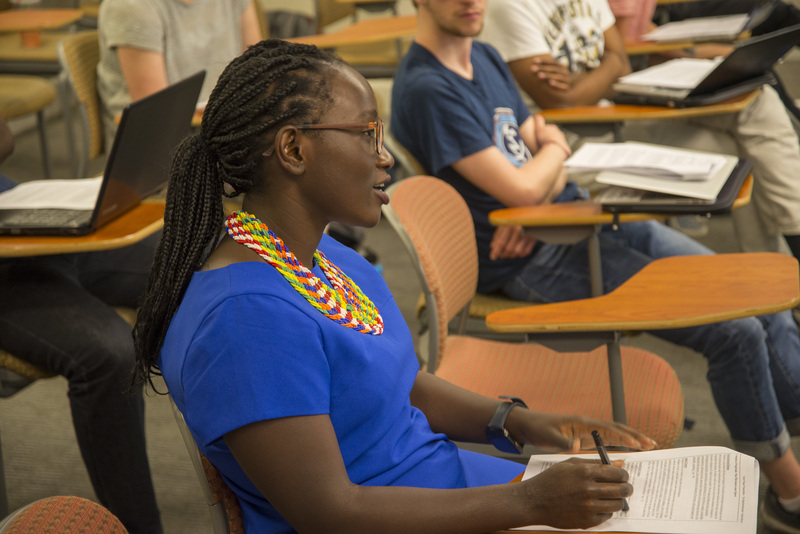 With six other institutions next door, our students have the advantages of a small school where class size averages 15 and professors teach every class, along with the opportunities offered by a larger university setting of about 6,000 undergraduate students.